Why are Mark 16:9-20 missing in most modern Bible translations? The claim has been made that since the publication of the King James Bible in 1611 many more and more ancient (i.e. earlier) Greek manuscripts from the New Testament have been discovered. And hence the claim is that these older manuscripts are probably more accurate, that is, they are closer to the original autographs, which were the God-breathed Greek words (2 Timothy 3:16), which God gave to the writers of the New Testament. For this reason most modern Bibles do not contain the verses Mark 16:9-20 or if they do they often state that there is evidence that they were not originally in the oldest Greek manuscripts. But is this true? Of the approximately 3,119 Greek manuscripts of the NT extant today, none is complete. The segment of text bearing Mark 16 has been lost from many, but over 1,800 contain the section and verses 9-20 are present in all but the 3 cited above. The footnote is thus unveiled and laid bare as dishonest and deliberately misleading in intimating that these verses are not the Word of God. The external evidence is massive. Not only is the Greek manuscript attestation ratio over 600 to 1 in support of the verses (1,800+ to 3 =99.99%) – all but one of the approximately 8,000 extant Latin mss,3 all but one of the approximately 1,000 Syriac versions as well as all the over 2,000 known Greek Lectionaries contain the verses. Mark 16:9-20 were cited by Church “Fathers” who lived 150 years or more before Vaticanus B or Sinaiticus Aleph were written: Papias (c.100), Justin Martyr (c.150), Irenaeus (c.180), Tertullian (c.195), and Hippolytus (c.200; see: John Burgon, The Revision Revised, London: John Murray Pub, 1883, pp.422-423). Vaticanus B is an “uncial” manuscript. This means that all the letters are block capitalized; there are no spaces between the words, and there are no vowels. It is a codex (a book, not a scroll) of 759 leaves (10? by 10? inches) with three columns per page, each of which ranges from 40 to 44 lines per column. There are 16 to 18 letters on each line. Vaticanus B adds to the Bible as it includes the Old Testament Apocrypha. Yet God said don’t add. It contains the Epistle of Barnabas (part of the Apocalyptic books of New Testament times) which teaches that water baptism saves the soul, again adding to the Word of God. However, the Word of God has also been deleted as Vaticanus B does not include Genesis 1:1-46:28, Psalms 106-138, Matthew 16:2-3, Romans 16:24. The Lord also said not to subtract. It also lacks Paul’s Pastoral Epistles (1st and 2nd Timothy, Titus and Philemon). In addition, the Book of Revelation as well as Hebrews 9:15-13:25 are missing. The latter teaches that the once for all sacrifice of Jesus ended the sacraments forever. There is also a conspicuous blank space where Mark 16:9-20 should be. Erasmus was well aware of Vaticanus B and its variant readings in 1515 AD at which time he was preparing the New Testament Greek text. Because they read so differently from the vast majority of the approximately 200 mss he had already examined, Erasmus considered such readings spurious. For example, Vaticanus B leaves out “Mystery Babylon the Great”, “the seven heads that are the seven mountains upon which the harlot (the apostate religious system that began at Babel of which the Roman church is a part) sits”, and leaves out “the woman which is that great city which reigns over the kings of the earth” which has seven mountains. All of this may be found in Revelation 17. 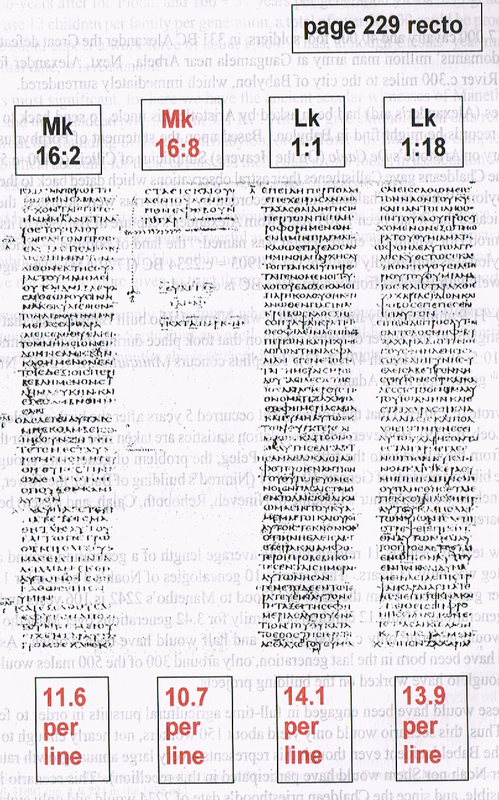 Mark 16 of the Vatican MSS has 42 lines in its first column and has only five letters in the 31st line of the second column. Thus there is a blank space left at the end of verse 8 separating Mark from the Gospel of Luke. That it is the only blank column in the entire 759 leaf MSS should alert us that something is very wrong here. 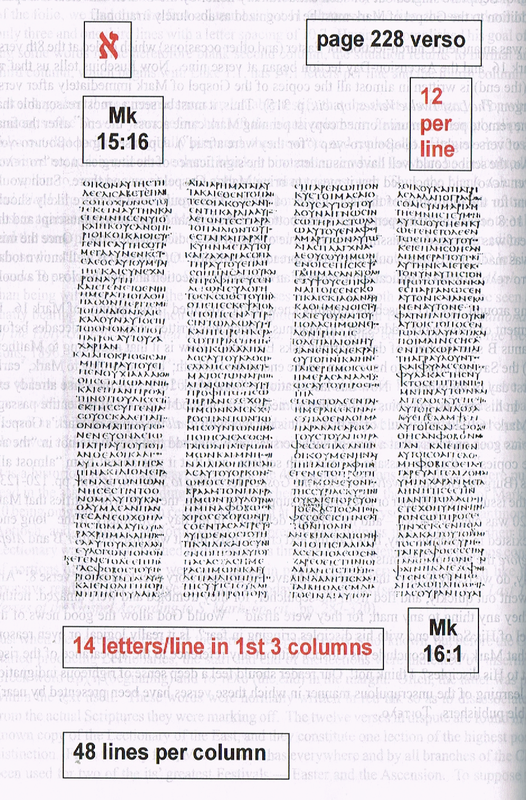 Mark 16:9-20 contains 971 Greek letters. Were 18 letters placed on each line in the void, 967 letters would be placed within it; hence, a scribe need only work in 4 letters over the last 53 lines. As the lines do not all equally end at the same place on their right margin, this would have been an easy task for any scribe. He certainly would not have placed a few scant letters on a single line in the following column to end Mark, leave the other 41 lines blank and then begin Luke at the top of the next column (a new book was always begun at the top of a column). Vaticanus written on very expensive vellum made from antelope hide; thus, great effort would have been taken to avoid such waste. Also an uncial, Codex Sinaiticus Aleph (ℵ, the first letter in the Hebrew alphabet) has 346 leaves or 694 pages each measuring 13 by 15 inches. Made from the finest antelope hides, each page. has four columns with 48 lines per column, and there are 12 to 14 letters to a line. The first portion of Sinaiticus was discovered in 1844 by Constantine von Tischendorf in the burn pile at the monastery of St. Catharine at the foot of Mount Sinai at which time he procured but 43 leaves of a Greek Old Testament (i.e., a Septuagint. That which is now known as Sinaiticus Aleph is the codex he brought from Mt. Sinai in 1859. It is always stated that Aleph is a “complete” Greek New Testament, but it is not. It adds, for example, the Shepherd of Hermas and Barnabas to the NT. It omits John 5:4,8:1-11; Mat. 16:2-3; Rom. 16:24; Mark 16:9-20; 1 John 5:7; Acts 8:37 and about a dozen other verses. The most significant fact regarding these fourth-century MSS is that in both Vaticanus B and Sinaiticus Aleph, John 1:18 reads that Jesus was the only begotten “God” instead of the only begotten “Son”. That is the original Arian heresy! The most widely used Greek text in Bible colleges and seminaries today is Eberhard Nestle’s Greek text. Nestle likewise reads… only begotten “God” which means that God had a little God named Jesus who is thus a lesser God than the Father. This means that at first there was big God and He created a little god. Thus, Jesus comes out to be a created being, a God with a little “g”, but at the incarnation a god was not begotten. Our Lord already was and always had been God. At the incarnation God begat a son who, in so far His deity is concerned, is eternal(Micah 5:2). This reading renders these MSS as untrustworthy and depraved! Yet these are the two manuscripts most venerated by text critics over the past century. The resulting corrupt Greek text has replaced the traditional Textus Receptus Greek New Testament which the believing Church has always accepted as the inerrant God-inspired word. Moreover, its readings have recently been verified as going back at least as far as AD 66. Indeed, until 1904 the Greek Church had guaranteed the Byzantine text of the Textus Receptus, but even it finally succumbed to the continual onslaught from so called modern scholarship. Although they till hold fast to the readings found only in the Byzantine manuscripts, the Greek Church has departed from its centuries held declaration that the Textus Receptus reflected precisely the NT it had hand copied all the way back to the time of the Apostles and has instead adopted a “majority Byzantine text” mindset. The result is, that even though nearly all are of a very minor nature, the 1904 (as well as their 1960 “upgrade”) text departs from the Textus Receptus almost 2,000 times (their estimation). Sinaiticus is not a bound codex. Thus, any given folio (a sheet of paper folded in half to form four pages) can easily be pulled free and later replaced. Tischendorf himself noted that the folio containing Mark 14:54 to 16:8 and Luke 1:1 to 1:56 had not been written by the scribe which he designated as “A”. He said that Sinaiticus exhibited a different handwriting and ink on this leaf. Tischendorf goes on to add that scribe A wrote all of the New Testament in Aleph except six leaves plus part of a seventh) and that these six (which included Mark 16) were written by A’s colleague, scribe D. He stated that D wrote part of the Old Testament and also acted as diorthota or corrector of the New Testament. Tischendorf also identified Scribe D as the man who years earlier had penned Vaticanus B and left out Mark 16:9-20 resulting in the third column being left blank! Dr. F.H.A. Scrivener, as well Hort, likewise concluded that D was the scribe of Vaticanus (Scrivener, A Plain Introduction to the Criticism of the New Testament, 4th ed, Edward Miller ed, London: George Bell and Sons Pub., 1894, Vol. 2, p. 337, fn. 1). But there is more. Tischendorf further observed that there is a change in spacing and size of the individual letters. This was done by scribe D in an attempt to place some words in the void left by his removal of verses 9-20 that scribe A had originally placed in the codex. This is seen in the first three columns on page 228 have 14 Greek letters per line; however, the letters in the fourth column are somewhat wider such that each line has only 12 letters. Coming to page 229 of the folio, we find that the first column has but 11.6 letters to the line, the second column has only three and one third lines with a letter spacing of 10.7. Having accomplished his goal of placing some words in the heretofore blank second column, the situation returns to normal and the third column, which begins with Luke 1:1, has 14.1 letters per line and the fourth column 13.9. Taken together, these circumstances testify that the sheet is a forgery. For whatever reason, scribe D, who years before had left the blank column in Vaticanus B, simply slipped the folio out that scribe A originally prepared, then rewrote and replaced it. He was obviously determined not to leave another column blank; a circumstance which for years he undoubtedly had to explain to various associates and authorities many times over. Thus, the blank column in B and Aleph are the work of a single scribe and thereby does not constitute the voice of two witnesses against the inclusion of Mark 16:9-20. The omission (or disappearance) is due to only one and the same person – the scribe who wrote B and then revised Aleph, or perhaps to an editor whose directions he acted. Furthermore, we have seen that the blank space Scribe D left in Vaticanus B proves that he knew of the passage. As he is the copyist of that folio in Aleph, rather than being witnesses against the last twelve verses of Mark 16, both B and Aleph must be seen as actually bearing testimony to their existence in antiquity (see: John Burgon, The Traditional Text of the Holy Gospels Vindicated and Established, Edward Miller ed., London: George Bell and Sons, 1896, pp.298-301). As to how and why verses 9-20 of Mark 16 came to be omitted in B and Aleph (ℵ), we do not know with certainty – we were not there. Still, as already shown, we do know that the passage as well as its precise content was well known when these highly vaunted codices were prepared. However, a likely, logical explanation which is borne out by ecclesiastical usage does exist. Just when the Lectionary first took the form of a separate book is not known, but before the Church started producing Lectionaries, the start and end of the lections were indicated by inserting the Greek word αρχη (beginning) and το τελο (the end) in the margin. Often, the latter was placed within the text itself. These words were normally written in red ink so as to disassociate them from the actual Scriptures they were marking off. The twelve verses in dispute are found in every kown known copy of the Lectionary of the East, and they constitute one lection of the highest possible distinction. From the very first, Mark 16:9-20 has everywhere and by all branches of the Church been used for two of the its greatest Festivals – Easter and the Ascension. To suppose a portion of Scripture singled out for such extraordinary honor by the Church universal is a spurious addition to the Gospel of Mark must be recognized as absolutely irrational. There was an ancient Church-lection for Easter (and other occasions) which ended at the 8th verse of Mark 16, and the Ascension Day lection began at verse nine. Now Eusebius tells us that το τελο (the end) is written in almost all the copies of the Gospel of Mark immediately after verse 8 (Burgon, The Last Twelve Verses, op. cit., p. 315). Thus, it must be seen as most reasonable that at some remote period an uninformed copyist penning Mark came across “the end” after the final words of verse eight–εφοβουντο-γαρ (“for they were afraid”). Upon seeing εφοβουντο-γαρ το τελο the scribe could well have misunderstood the significance of the liturgical note “το τελο” (or even τελο) and concluded that it meant to bring Mark’s Gospel to an end there. Such would account for the mutilation of the last chapter of Mark. This would even be more likely should Mark 16:8 occasionally happen to fall at the bottom of the left hand page of a manuscript and the text leaf was damaged or missing (which is true of one of the codices at Moscow). Once the mistake was made, any copies would obviously spread the omission. Of course, it is well known today that “το τελο” (or τελο) indicates the close of an ecclesiastical lection and not the close of a book. Writing around 325 AD, Eusebius certainly knew of the so called “long ending” of Mark 16. In a fragment of a lost work addressed “to Marinus” which was written at least two decades before Vaticanus B saw the light of day, Marinus asks Eusebius: “How is it that according to Matthew (28:1) the Saviour appears to have risen ‘in the end of the Sabbath;’ but, according to Mark, ‘early the first day of the week’?” Now this last citation is from Mark 16:9, thus the verse already existed. In his answer, Eusebius replied that someone who wished to get rid of the entire passage (i.e., Mark 16:9-20, fnj) would offer that “… it is not met with in all the copies of Mark’s Gospel”. Eusebius goes on to say that a man of such persuasion would add that they were not in “the accurate copies” — that the passage is “met with seldom” and that it was absent from “almost all” copies (Burgon, The Last Twelve Verses of the Gospel According to S. Mark, op. cit., pp. 120-123). Here the issue is not whether or not Eusebius supports the verses, the point is he testifies that Mark 16:9-20 was clearly known — and its validity debated — in his day. Obviously, if the “long ending” existed in Eusebius’ day, how can the text critics insist that it was inserted after B and Aleph but before the time of Erasmus? Finally, do we really believe that God would have the greatest story ever told end at verse 8: “And they went out quickly, and fled from the sepulcher for they trembled and were amazed: neither said they any to any man; for they were afraid”. Would God allow the good news of the Gospel of His Son to end with his disciples cringing in fear? Is it really logical or even reasonable that Mark would conclude his Gospel without any reference to the appearance of the risen Christ to His disciples? I think not! Our reader should feel a deep sense of righteous indignation upon learning of the unscrupulous manner in which these verses have been presented by nearly All Bible publishers. Tο τελο. Floyd Nolan Jones’s clear reasoning is that the verses Mark 16:9-20 were known and quoted by the Church Fathers. About 60% of the 4383 quotations from the seventy-six Church Fathers who died before 400 A.D. are in agreement with the Traditional Text, what we have in the Textus Receptus.4 The Traditional Text is not what is spurious, but Vaticanus B and Sinaiticus Aleph are forgeries. These are manuscripts which are so heavily relied upon in nearly all modern Bible translations yet very few extant Greek mss agree with their readings and they greatly disagree with each other. Trust in what God has given us in the Textus Receptus (the Received Text).5 The vast majority of the extant Greek New Testament mss use the Received Text. That is, about 99% of them or about 5210 of the 5255 extant mss known today. Only a matter of 45 are discordant and Vaticanus B and Sinaiticus Aleph are among them. You can download a complete work about the Bible from Dr. Floyd Nolen Jones, Which Version is the Bible in PDF format. Floyd Nolen Jones Th.D. Ph. D, The Mutilation of Mark 16:9-20, printed in King James Easy Reading Study Bible, pp. 533-539, Kings Word Press, Humboldt, Tn, USA, 2010. I’d like to thank my good friend James Japan for extracting the text using OCR software. D.A. Waite Th.D., Ph.D., Defending the King James Bible, A Fourfold Superiority, The Bible for Today Press, New Jersey USA, 2006. Textus Receptus (TR), or the Traditional Text, is the basis of the NT in the King James Bible. There are only a few modern Bible versions in English, which use the TR. One is the Literal Translation Version (KJ3 ). Also there is the King James Bible Easy Reader (KJVER). The New King James Version (NKJV) is not based on TR but a corrupted form of the Majority Text. This entry was posted in Greek New Testament, The Bible and tagged Church Fathers, Codex Sinaiticus, Floyd Nolan Jones, Floyd Nolen Jones, Greek Church, Greek manuscripts, John Hartnett, King James Bible, manuscript forgeries, Mark 16:9-20, modern Bible versions, Sinaiticus Aleph, Textus Receptus, Tischendorf, Traditional Text, Vaticanus B. Bookmark the permalink. 4 Responses to Why are Mark 16:9-20 missing in most modern Bible translations? I think it is obvious to most scholars that Mark’s gospel is incomplete, and it seems his detailed account gets cut off essentially mid-sentence (on a conjunction) at verse 8. One suggestion is that as much as 20% of the original document was accidentally detached and lost before the first copy was made. This very unfortunate truncation obviously called for some sort of rounding off summary to be added by a later copyist and that is what many believe appears as verses 6 to 20 (often called the “longer ending” – scholars have identified 3 or 4 different endings). This is not the way Mark would have continued his account had it been him writing, and in my opinion the content is somewhat dubious although it has been accepted almost universally by the church throughout the middle ages. Unfortunately which books should form part of the canon are not dictated by God, but must be chosen and accepted by the church. When writings of Godly men have been highly valued and loved for long enough by the vast majority of believers, then they just naturally become part of the canon by common consent. The process by which the obviously late insertions to books have been included is just the same: Although the writer may not be known, (also the case for many of the accepted books) the extra verses have likewise been valued and loved for many hundreds of years by the vast majority of believers. Therefore they belong in the canon with the rest of the collection. At least this was the argument for accepting the complete Textus Receptus that the pastor of a church I attended offered as his view. For this reason this pastor regarded even the well established as very-late-date insertions to be authoritative – such as 1 John 5:7 “There are three that bear witness in Heaven: the Father, the Word, and the Holy Ghost: and these three are one”. This significant discrepancy is another reason to guess that it was not written by a close eye-witness of these events such as Mark. I can’t imagine someone who remembered the scene themselves having made this mistake. Other mistakes – like Luke suggesting that eleven disciples were gathered together in the room (obviously only 10 were present) – are easy to understand and pass off as a simple oversight or a common way of speaking of the group after Judas’ betrayal. On your first point in your paragraph 1, you may not have read the full article because I had not finished uploading the last half of it until last night. Nevertheless, in that section, Dr Nolen Jones provides strong evidence that the missing verses were definite and well known by the Early Church. There was only one reading on the verses Mark 16:9-20 in question. The only thing dubious is their exclusion, in the Alexandrian manuscripts, which would seem to imply they are forgeries. On the topic of the selection of canon of Scripture. It is my belief that though man chose, i.e. councils of Early Church Fathers decided which were inspired and which were not, God’s Will was accomplished. He just used men as a means to accomplish what He wanted in His providence. God is omnipotent and though humans choose themselves, God accomplishes His Will in all the affairs of men. So the choice and editing process that Desiderius Erasmus and later scholars like Theodore Beza (disciple of John Calvin) used was to achieve an end that resulted in the Traditional Text , which underlies the King James Bible. This Scripture has been entitled the “Johannine Comma” by textual critics. The verse as found in the King James is the strongest single Scripture on the Holy Trinity. As such, it is not surprising that it should be the subject of vehement debate and an object of Satan’s attack. It is a shameful, sad comment upon our time as to how readily modern Christians will surrender this and other passages on “textual grounds” without bothering to delve more closely into the evidence. After that he appeared in another form unto two of them, as they walked, and went into the country. 13 And they went and told it unto the residue: neither believed they them. 14 Afterward he appeared unto the eleven as they sat at meat, and upbraided them with their unbelief and hardness of heart, because they believed not them which had seen him after he was risen. And they rose up the same hour, and returned to Jerusalem, and found the eleven gathered together, and them that were with them, 34 Saying, The Lord is risen indeed, and hath appeared to Simon. 35 And they told what things were done in the way, and how he was known of them in breaking of bread. 36 And as they thus spake, Jesus himself stood in the midst of them, and saith unto them, Peace be unto you. 37 But they were terrified and affrighted, and supposed that they had seen a spirit. 38 And he said unto them, Why are ye troubled? and why do thoughts arise in your hearts? 39 Behold my hands and my feet, that it is I myself: handle me, and see; for a spirit hath not flesh and bones, as ye see me have. These are not inconsistent. You do not know of the exact timing of the events. Mark’s account may have more detail filling in the period between disbelief and believing, else Jesus would not have needed to berate their disbelief. So Luke’s account appears to skip that sequence of events but it has the same outcome. Verse 36 Jesus appears to them and in verse 37 they could not believe it was him, and Christ berates them in verses 38,39. These are not contradictory but in fact typical of even multiple eyewitness accounts of an event, say, years after the event. Also you cannot say ‘obviously only 10 were present,’ as if Luke made a mistake. You may be reading in something more that you realise. I would be very cautious there. But this is what textual critics do. Yet they are limited in knowledge, and just maybe the piece they do not have changes the outcome. It is like the so-called extra Cainan (Canaan) in Luke 3:36. Some say a copyist error. Could be! But I don’t believe the scripture is in error and in fact it may be explained by an adoptive son. God is capable of preserving His Words (in the autographs and in their subsequent transmission). This must not be prematurely rejected. This is a good explanation of what happened on the road to Emmaus. In the sentence, “Obviously, if the “long ending” existed in Eusebius’ day, how can the text critics insist that it was inserted after B and Aleph but before the time of Erasmus?”, you mean Eusebius, not Erasmus. James: No, my understanding is that Floyd Nolen Jones is saying that evidence existed in Eusebius’ day of the long ending (c.325 AD) but critics insist it was inserted after the 4th century (after Sinaiticus Aleph) but before Erasmus (15th century). So that makes no sense.